On the 10th of May 1959 was discovered the Petralona cave, which had been accidentally located by Philippos Chatzaridis. One year later (16-9-1960) the fossilized cranium of a prehistoric man, covered by stalagmitic material, was found by Christos Sariannidis. Followed a short report, published on the newspaper of Thessaloniki “Macedonia” (18-9-1960), astonishing the scientific world, because in Greece was never found before a prea- Homo sapiens skull. The many questions raised were out of the field of the standard archaeological methodology, especially concerning the age of the find. The main tool for providing the answers, is the science of palaeoanthropology in combination with the stratigraphical, palaeolithical, palaeontological and archaeometrical data. At that time, specialists in the particular subject, did not exist in Greece, and for that reason, Professors of the Thessaloninki University assumed the responsibility of keeping the human cranium. Same Professors, proceeded with surface collecting of animal bones, that were spread on the stalagmitical ground of the cave and invited from abroad two German scientists: the anthropologist E. Breitinger and the palaeontologist O. Sickenberg. At the same time, they also contacted the anthropologist Dr. Ar?s Poulianos at Moscow University, known by his thesis: “The origin of the Greeks” (first edition 1960), which was based on craniological and anthropometrical studies of modern Greek populations from Crimea to South Italy. With these studies, Aris Poulianos demonstrated that the Greek people are autochthonous, and that their roots are common to those of the ancient Greeks. By this thesis, he opposed the previous and widely accepted theories of the German anthropology, which classified Greeks among Slavic and other peoples. 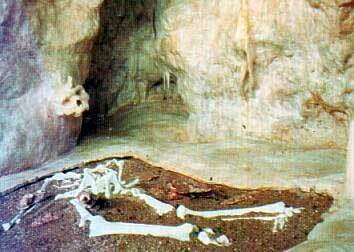 Regarding the fauna and the man of the Petralona cave, Breitinger and Sickenberg (1964), came to the conclusion that they are of about 70.000 years old, while Breitinger affirmed also that, from the anthropological point of view, the cranium is so much similar to some African findings, that can be cosidered as the “first African out of Africa”. The Geological Department of Thessaloninki University adopted these conclusions, and furthermore, raised the hypothesis that the human skull drifted inside the cave by some kind of strimwater and thus no palaeontological or stratigraphical setting of the cranium can be sustained. Aris Poulianos, after 1965 (year of his return from the former S. Union) continued his studies on the cranium and the Petralona cave. Contrary to Breitinger, he stated what today is considered as an established view, that the Petralona man presents a clearly European ancestral morphology, which is developed at the area of the South Eastern Europe. The almost perfect orthognathy, the shape of the dental arch, the construction of the occipital bone, were among others, the basic arguments of Aris Poulianos. The need for systematic excavations and not only surface collection of findings was imperative. The realization of these excavations, was delayed due to the military coup in 1967, the removal of Aris Poulianos from every state job, but also because of his forced exile for a few months to the islands of Giaros and Leros. Despite all that, and with perseverance, in the spring of 1968, he managed to proceed with the first excavation of a cross-section in the Petralona cave. The excavations were ceased within a month in a dictatorial way, but the scientific conclusions which are announced to the Press (April 18th and 19th of 1968 and published in the journal “Archaeology” in January of 1971), are once again different from the previous studies. I.e., it is ascertained the existence of a cave stratigraphic sequence, which dates back more than 700.000 years and, the human presence in almost every geological layer. A presence that becomes evident from the discovery of palaeolithic tools of the same age and the traces of the most ancient -until today- traces of fire that was ever lit by human hand. These discoveries, revised not only the theories regarding the Petralona cave, but also all the previous beliefs about the exit of man from Africa and his arrival to Europe 200-300.000 years ago. It was then when Sickenberg, complaining that he didn’t have comparative osteological material during the first study of the fossils in Thessaloninki, he asked for the findings to be send to him for a second study. Unfortunately, many of these findings were never returned. His new study (1971-1975) resulted in what he called “revision of the Petralona cave fauna”, which was in accordance with the age determined by A. Poulianos in 1968-1971. The excavation and research continued when the dictatorship fell, basically from 1975 up to 1983, with permits given by the Ministry of Culture and the Archaeological Department. Since there was no other more qualified authority, the permits were edited in the name of Aris Poulianos as President of the Anthropological Association of Greece (A.A.G.). Worth to mention that thanks to his efforts the Department of Palaeoanthropology-Spelaeology of the Greek Ministry of Culture was established, with the hope of functioning in the future as the main institution of protecting the palaeoanthropological findings of Greece. At the same time, the land of the cave was expropriated by the Greek Organization of Tourism (G.O.T.) and under special agreement, the scientific utilization (1979) of the cave and the findings were assigned to the Anthropological Association. On the expenses of the A.A.G., the building of laboratories for the needs of the excavations, and the construction of a Museum and several guest houses (1980/1), with a total capacity of 2.000 sq.m. went on. The new conclusions, which resulted from the second excavating period, produce new evidence which is based on the studies of what is perhaps the biggest international scientific group ever formed for such a scientific topic (46 specialists, from 12 countries). The Ph.D. Professors B. Kourten (Finland), M. Kretzoi (Hungary), M. Ikeya (Japan), I. Horacek (Czech Republic), G. Belluomini (Italy), A. Moigne (France), R. Murrill (U.S.A.), are among the most sonorous names of the associates chosen by the Anthropological Company for staffing the research. From the Greek side the names of G. Maniatis of “Demokritos” (nuclear laboratory), G. Lyrintzis of the Athens Academy, S. Papamarinoppoulos of Patra University and C. Papastefanou of Thessaloniki University, should be mentioned. Epigramatically, the new conclusions as a whole, apart from confirming, with the use of the most modern methods of absolute chronology, the age originally determined by Aris Poulianos, they also concern the stratigraphical relation of the cranium of the so called Archanthropus with various materials, which date back at about 700.000 years. The application of the most analytical excavating methods led to the discovery of remarkable findings like fossilized pieces of wood, an oak leaf, animal hair and coprolites. These methods also gave the possibility of correlation of various excavating sites from Siberia to England, as well as of the safest age control between them (through their stratigraphical and palaeontological horizons). The almost continuous presence of the stone and bone tools of the Archanthropus evolutionary stage, from the lower (~750.000 years) to the upper (~550.000 years) layers, showed his long lasting presence in the Chalkidiki area. Besides, the pattern of the evolutionary course in the area never stopped, since, anthropologically, Archanthropus’ nearest modern descendants was proved (already from 1973 at the 9th International Anthropological Cogress in Chicago by Aris Poulianos) are the nomads of Pindos mountains, known as Sarakatsani and in general, the inhabitants of the S. Balkans. The author (son of Aris Poulianos) is Ph.D. in Anthropology of the Florence University and member of the International, European and Greek Anthropological Associations, working at the Department of Palaeoanthropology-Speleology of the Greek Ministry of Culture. In his doctoral thesis he proceeded to the research of a part of the Petralona cave findings and to the composition of the up today studies, examining also the opposite opinions that had resulted from time to time. In the preface of the thesis, the Director of the Florence Institute of Anthropology, professor Brunetto Chiarelli, quotes : “… The main evidence for concluding that the inhabitation of Europe amounts to at least 700.000 years, is the human cranium which was found in the Petralona cave … This work forms an offering of a highly European standard… with many original data about the antiquity, the conditions and way of life of this prehistoric man. Another side is the discerning but impartial presentation of the intense scientific disputes, in which were carried along and implicated even Greek governmental departments…”. As previously mentioned, the excavations of Aris Poulianos continued until 1983. This occurred because they were interrupted for a second time, and obviously for reasons completely irrelevant to science. Any access was denied to the members of his team so much to the excavations, as well as to the findings, something that is opposed to every concept of human and research rights. As a result of this, for 15 years the findings remained inaccessible to study and kept at the mercy of deterioration, inside the Museum. One approach to the reasons caused this situation is the fact that the evident target was: a) to conceal the extend of errors which preceded the A.A.G. excavations and b) to prevent the extraction of whatever new scientific conclusions remained yet hidden, so much in the unpublished findings of the Museum, as well as in the sediments of the cave. In relation to the above, an analytical memorandum was submitted to the bureau of the Ministry of Culture in September of 1994. In this, is reported with clarity that besides the efforts (manifested even in official meetings) of snatching away intellectual work, the Ministry’s position after 1983 mainly favored the competitive, mostly foreign, institutions that are involved with relative studies. Because it is perfectly clear that the braking of the research of Aris Poulianos gave the chance to the excavators and researchers from abroad, to reconstruct and reorganize their theories on similar matters. As a result our country was deprived of the advances that was deserved. In 1997 the Anthropological Association of Greece, after 15 years of trials, was justified by the Supreme Court and was ordered the continuation of its works in the cave. Since then the G.O.T. and the Ministry of Culture are trying in any way to overcome the Courts Decisions (p. ex. by stopping the water and telecommunications supply, or even by changing the low). Such a tactic is not acceptable by the A.A.G. and further trials proceed. In conclusion, and on the occasion of the 40th anniversary of the greatest discovery of the century in the field of Anthropology, one may say that from the Anthropological Association of Greece all means possible for the protection of the findings and for the projection of their great scientific importance were disposed. With or without the help of the state, it is a necessity but also an obligation for this effort to be continued. The anthropologists by the nature of their studies cannot be anything but optimistic. And this, because they are taught and they teach (in spite of some steps backwards) the almost constant biological, social and spiritual evolution of man, and a unique milestone of this evolution is the Petralona Archanthropous. Note : The above text is here updated, originally published in the magazine “Mandragoras”, v. 10-11, January-April 1996.